Captain Ken Barr. Weapons Company. 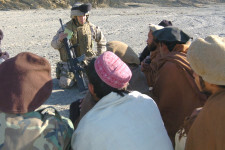 Khowst Province, Afghanistan. January 2005. Captain Ken Barr (center). Weapons Company. 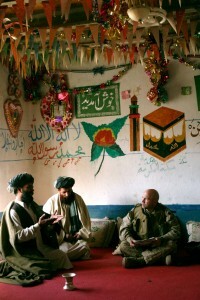 Khowst Province, Afghanistan. April 2005. 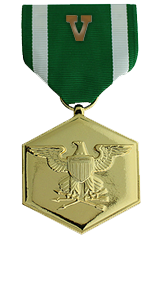 Heroic achievement in connection with combat operations against the enemy while serving as Commanding Officer, Weapons Company, 3d Battalion, 3d Marines, Combined Joint Task Force-76, in support of OPERATION ENDURING FREEDOM. 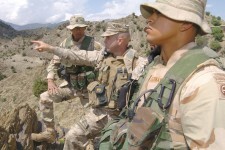 On the night of 11 January 2005, Captain Barr along with First Platoon came under an overwhelming volume of small arms, machine gun and rocket propelled grenade fire from enemy forces in several covered and concealed positions. Captain Barr maintained impeccable bearing and composure while directing the platoon in the defensive to repel the enemy attack which lasted approximately 30 minutes. When a Marine was shot in the arm, Captain Barr, disregarding his own safety ignored voluminous fire and moved throughout the engagement area to gain satellite reception to call for a medical evacuation and close air support. His actions led to the enemy’s withdrawal and saved the lives of Marines and sailors. By his enthusiasm, professionalism and unwavering devotion to duty, Captain Barr upheld the highest traditions of the Marine Corps and the United States Naval Service.